Our eco-friendly recycled rubber treadmill mats are manufactured in the USA and offer superior performance, durability and appearance. They are suitable for both interior and exterior applications. Ideal exercise equipment mat for treadmills, elliptical trainers, rowing machines, ski machines and other similar types of exercise equipment. These extra large treadmill mats are 4' x 7'6" x 1/4" in size and weigh approximately 41 lbs. These commercial grade, shock absorbing, anti-fatigue rubber mats provide resilience, sound absorption, spike resistance and traction. These are 100% premium recycled rubber mats specially designed and manufactured for durability and also serve as an effective way of reducing noise and vibrations. The non-slip surface is easy to clean and maintain, and will be your treadmill mat solution for many years to come. Provides Excellent Traction – even when wet! Indoor cleaning involves a broom, damp sponge, mop or vacuum cleaner. 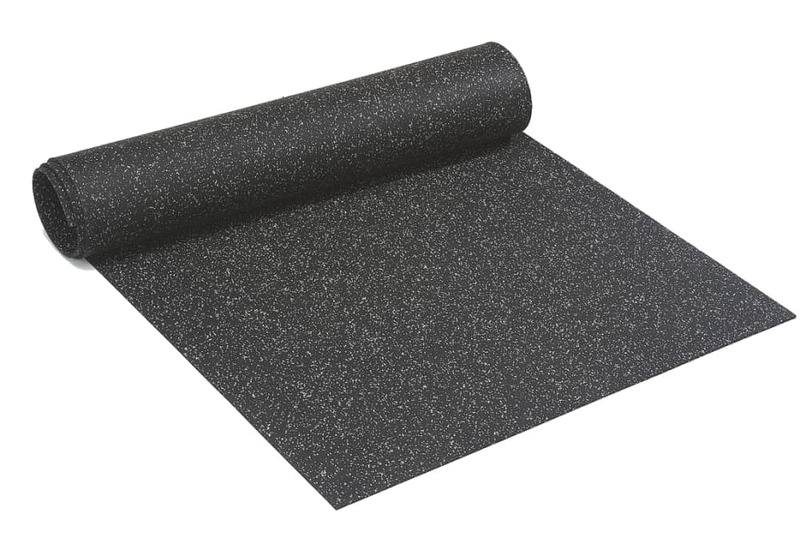 Our eco-friendly recycled rubber treadmill mat offers superior durability and is suitable for both interior and exterior applications. Exercise equpment mats are ideal for use as a rubber treadmill floor mat, an elliptical mat, or as exercise equipment mat for various other types of exercise machines. These rubber mats provide resilience, sound absorption, spike resistance and traction. 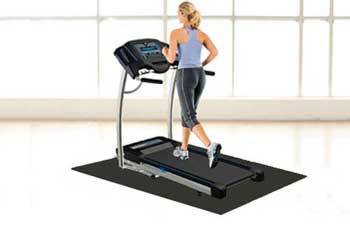 Our Rubber treadmill mats offers excellent performance, durability, and appearance. The 100% recycled mats are specially designed and manufactured for durability and also serve as an effective buffer against acoustical vibration. The non-slip surface is easy to clean and maintain, and will be your treadmill mat solution for many years to come. 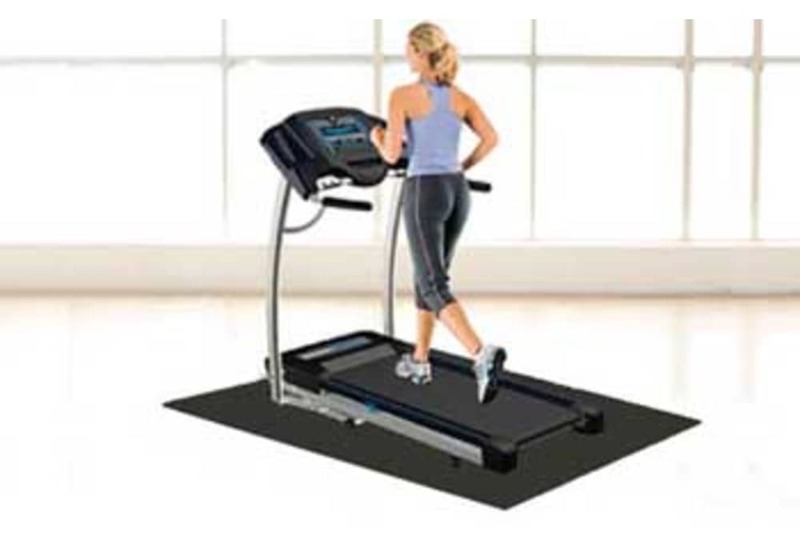 These eco-friendly rubber treadmill mats are manufactured in the USA from recycled scrap tires. Provides Excellent Traction, even when wet! Easy cleaning: Indoor cleaning involves a broom, damp sponge, mop or vacuum cleaner. Keep in mind, initially rubber always has a "rubber" odor that will diminish over time. Ideal exercise equipment mat for treadmills, elliptical trainers, rowing machines, ski machines and other similar types of exercise equipment.. Extra large treadmill mat size: 4' x 7'6" x 1/4"
Also see our Standard Size Vinyl Treadmill Mat. 4' or 5' wide. Up to 100' long.